i have a few areas in my life right now as a mama, wife and woman, that require hard and uncomfortable work in the short-term. i am in a time of really seeking GOD’s wisdom and strength to be more than i am capable of being; do more than i am able to do. as a mama, some things come very natural for me … nurturing, tending to soul and heart issues, cultivating love and relationship. these things flow. but i am not so strong and “natural” in areas of training toward character … a fine line difference but one that hubby and i clarified in one of those intense and productive and heartfelt convo’s recently. so, we are pressing in, uniting as “team green” and implementing some real changes and strategies on the home front. discipline of kiddos takes discipline for this mama … hard at times in the short-term, but essential in the long-term. another area of short-term effort for long-term gain is exercise. i have been in reactive mode with my exercise; doing it when i can, some days. reflecting on this, i know for sure that when i am proactive about executing an exercise plan, i feel SO much better … physically and mentally. it’s essential. and during this season of continued sleeplessness, baby care and homeschooling … it is hard. but i know that i know that i must. another area that is begging for short-term discipline for long-term gain is in stewarding the nutrition and health of my family. the decisions around what we eat as a family are primarily made by me – big burden and excellent opportunity. a few goals have crystallized (and i’ve put them on a note in my kitchen window): “strengthen immunity: reduce sugar, clo, probiotics”. these things have risen recently to mind in my reading and research and will be areas of implementation around here. i’d love to hear the stirrings you are having these days … areas of resolve, focus, implementation. 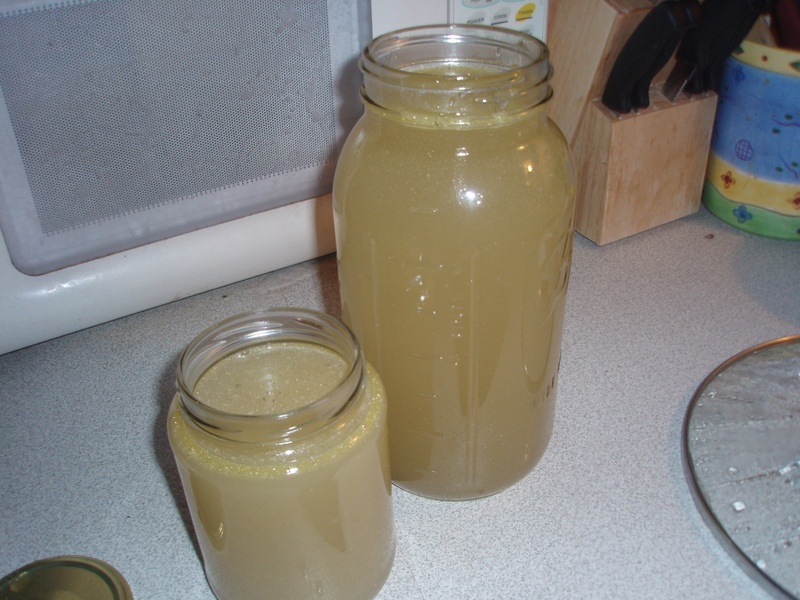 for no good reason, i spent a long time being intimidated by making chicken broth! i knew i *should* try it and would be so glad once i did; but i put it off for the longest. finally, last year, i took the plunge. and i have to say: IT IS SO EASY!! seriously, so simple. you can’t really mess it up. 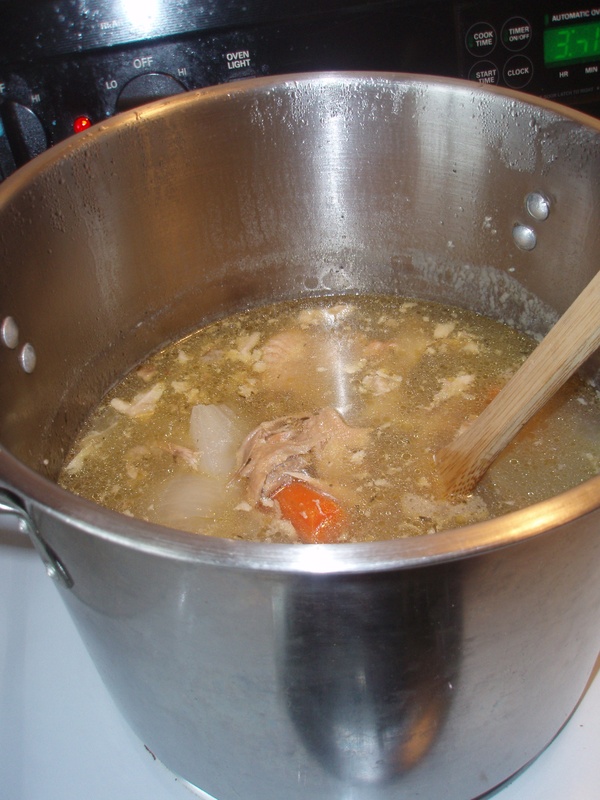 there is no “right way” but a general method that is used and tweaked; for example, some people make broth with just the bones, others add vegetables. some add a specific type of veggies; others add whatever has been “composted” and discarded in their kitchen over the week. there is no way to mess this up and there are innumerable benefits, so i encourage you: give it a try! add everything except parsley to a stainless steel stock pot and allow to stand for 30 min-1 hour. then, bring to a boil, and remove scum that rises to the top. reduce heat, cover and simmer for at least 6 hours (up to 24 hours … the longer it simmers, the deeper the flavor. i like to let it simmer overnight, or for the day while i’m gone). about 10 minutes before you are finished simmering, add parsley (which adds minerals to the broth). 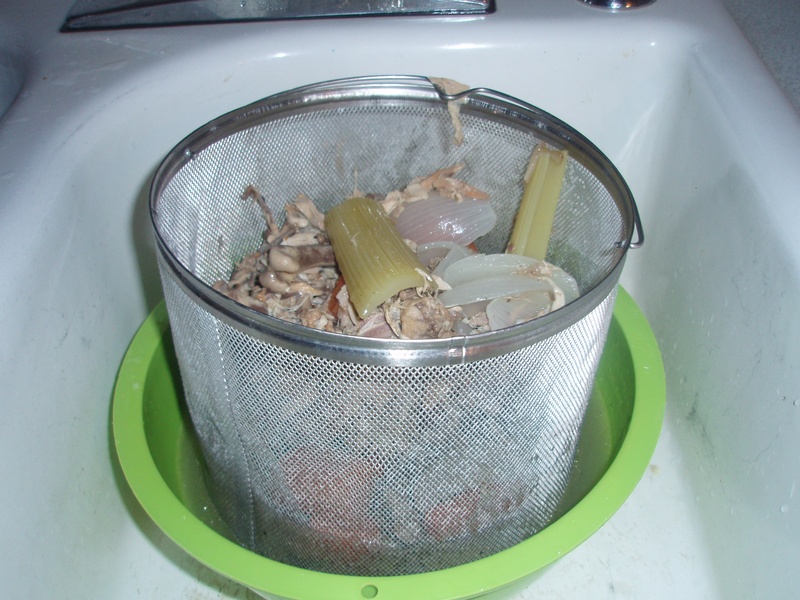 when finished, pour stock through a strainer in to a bowl to remove bone fragments. then i pour it in to glass jars for storing, being sure not to seal and refrigerate until the broth has completely cooled. you can store this in the refrigerator or freeze (i’ve poured in to ice cube trays to freeze – the popped out of trays in to bag to keep in freezer). 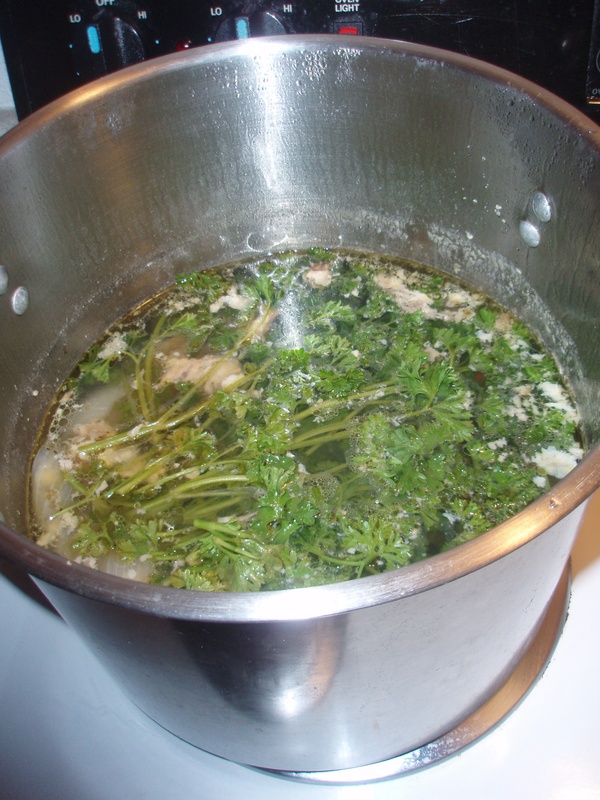 this broth tastes so good “straight” … very healing and soothing to the gut. i use it often; instead of water when cooking rice, quinoa, etc; as a base for soup, etc. it is truly delicious! so, in the next couple weeks, i will share about a few steps that feel like “big”, foundational ones for me: making chicken broth and fermented vegetables. i’ve been stirred and motivated to do both of these and finally, in recent months, have! so i will post some pics, some basic steps, some good research and info. and i’d love to hear yours! for today, i want to share some absolute nuggets of wisdom in this whole process of taking steps in the right direction. this is from a book entitled, “Nourishing Hope for Autism; Nutrition Intervention for Healing our Children” by Julie Matthews (thanks, Kelly, for letting me borrow this book!). although our family does not struggle w/autism, i found tremendous insight, information and practical steps that i believe would be of great benefit to the health of everyone, not just those with autism. i encourage you to check this book out for greater detail on the steps to follow! phew! A LOT … of good steps. i am struck by the realization that i have incorporated many of these steps but VIRTUALLY IGNORED step #1!! as in, i need to remove some of the serious “offenders” before i can hope that all the good things we are ADDING will have their full, positive impact. there are so many changes that i’ve implemented in our home; in what we eat, especially. and there continue to be so many other changes and improvements that i am stirred to make – it can be overwhelming! but in all things, grace … for the steps that we can take, when we take them; and for the beauty of what will unfold in the future. i look back over the past few years and see the pretty radical changes that we’ve made; and yet, there are many more! so, i’ve decided to do a series here on my blog, about the specific step i will be taking, at that time. i may include some of my thinking (generally inspired by quite a bit of research and learning) that is prompting me toward this specific change. my overarching desire is to be a faithful steward of of this vessel and to continue to move my family and my home in to greater health and less “toxicity.” specifically, i am desperate for healing for a specific health issue of my daughter’s that is related to what she eats and comes in contact with; as well as my own health, which hit a low point this last fall but is steadily improving, thank GOD. so for today, part 1! i sat down this morning with my file folder/divider, and pulled out my information (i collect as i read and find) under the heading, “cleaning.” something i read this morning rekindled my desire to really improve the products and systems that i am using to clean in our home. 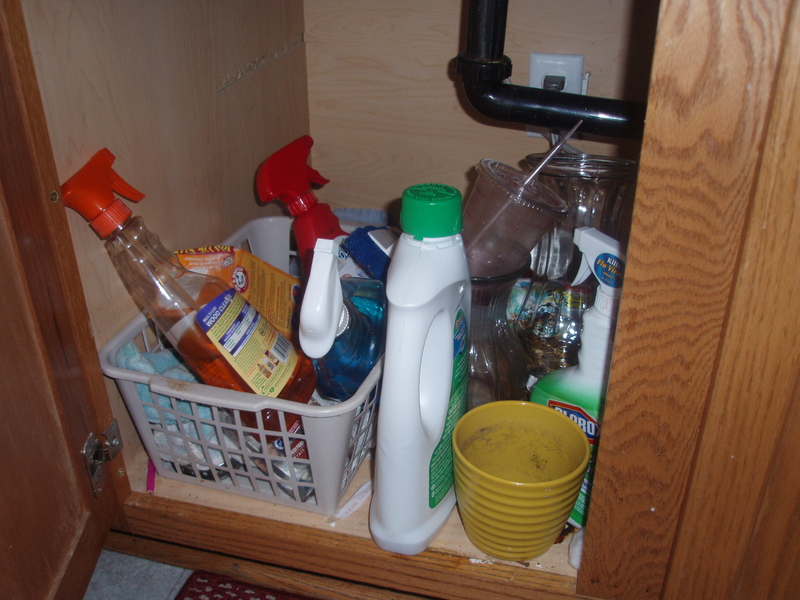 i want to eliminate heavy chemical, toxic cleaners and to instead utilize frugal, safe choices. This is where i am starting. i want to make my laundry detergent and have a great recipe (from passionatehomemaking.com) for this; one thing at a time! 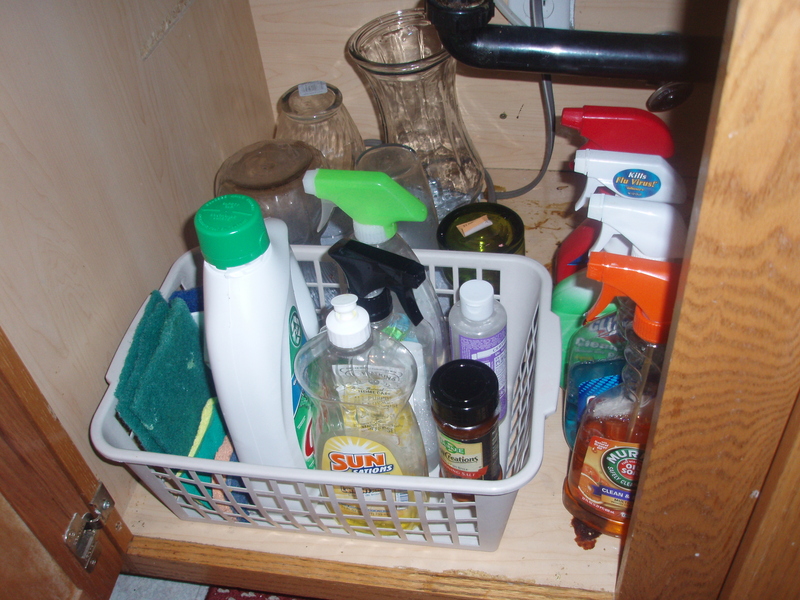 for the sake of being frugal, i will likely use what cleaners that i have on hand until they are gone, then instead of replacing … i will use the frugal, safe options listed above! a scary picture of the "before" under the sink ... this doesn't include all the cleaners i kept on the counter by the sink!